Edenland Park is an adventure park situated in the south-western corner of Snagov Park, reachable within 20 minutes from Bucharest (around 40 km from the city centre). 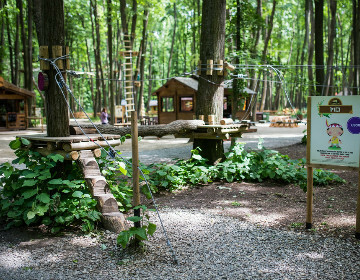 The adventure park includes 12 tree tracks and a climbing wall and other activities such as height jumping, archery, horse riding, paintball, ping pong and bike rentals. Edenland Park also provides a restaurant and an original accommodation in fully equipped tree houses. Locals in Bucharest have reviewd Edenland Park Balotesti - Kids attractions in Bucharest. You can find here description, reviews, address, map, phone, website of Edenland Park Balotesti in Bucharest. Visit Bucharest Tips for more Kids attractions in Bucharest!